We stock a large selection of hot tub pumps in many different sizes for most spas in Canada. We carry most sizes from the Executive 48 3/4HP to the Executive 56 series 5HP and all models in between. When a replacement Waterway spa pump is needed, most of the popular sizes are ready for quick free shipping from locations across Canada. 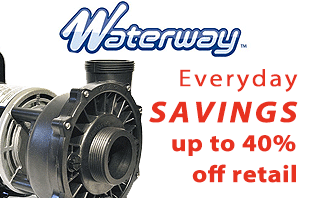 Pump Adapter - Converts 2" Intake/Discharge to 2-1/2"
Waterway Hi-Flo, 48 Frame 3HP 2 Speed, 230 Volt Pump 2" in-out 2"